Active photographers interested in combining form and function with fashion will appreciate this Jack Essential Lens Bag in brown from Jill-E Designs. For strength and durability, the Jack is made from tough, weather-resistant, heavy-duty ballistic nylon fabric. It can store and protect a 12" telephoto lens or three medium-sized lenses plus extra batteries, memory cards, a flash, and accessories. Adjustable interior padded dividers allow for a variety of gear configurations. An exterior pocket is useful for storing small accessories such as cleaning cloths, your keys, or an ID. The Jack features a wide drawstring top closure and an adjustable shoulder strap. Jill-E has designed the bag to coordinate with their smaller Messenger and Swing bags. 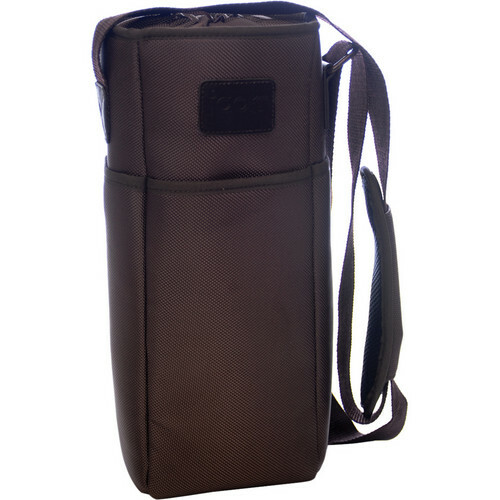 Box Dimensions (LxWxH) 13.1 x 6.6 x 3.9"
Jack Essential Lens Bag (Brown) is rated 3.0 out of 5 by 1. Rated 3 out of 5 by TommyTuff from Not Very Durable I purchased this bag to hold my Tamron 150-600mm lens. I liked the design because it is a soft case and has a nice shoulder strap. I also like the fact that I could put this into my large camera case. It seem durable at first, but after 1 year the seams are pulling apart near the opening. I guess you get what you pay for. This is a relatively inexpensive case.